Pokémon Go has gone straight to the top of the gaming charts in the US and Australia, where it was first released at the start of July. The smartphone-based game has already been downloaded by nearly 6% of US Android users. What makes this latest installment of the 20-year-old Pokémon franchise so appealing is its extensive use of augmented reality (AR): players use their smartphones to reveal fantastic creatures in the real world and then try to catch them. It is the first time an augmented reality video game has achieved such global success, and its initial impact on our society is quickly becoming apparent. We have an invaluable opportunity to observe how new ways of interacting with technology affect our lives and how they can be regulated. Pokémon was already the world’s second best-selling video game franchise, with more than 200m units sold worldwide since it became globally popular in the 1990s. But the phenomenon involves a wide spectrum of elements, from toys and merchandise to animated TV shows and movies. Pokémon are fictional creatures that can be trained to battle each other for sport. Yet, arguably, part of the games’ success is that they encompass different genres, including role-play, puzzle and digital pet. The latest game, Pokémon Go, is a free smartphone app developed by Nintendo and Niantic Labs. Its novelty is that it exploits augmented reality. Images of the real world captured with the phone’s camera are layered with gameplay so that players can find Pokémon when they move around with their smartphone. Some real-world locations are also used as the game’s shops or gyms, where players physically go to virtually train their Pokémon or to collect items. Although augmented reality technology has been around for many years, Pokémon Go remarkably is one of the first significant attempts to extend the video game experience with AR. Before that, only the strategy game Ingress – also from Niantic Labs – scratched the surface of this technology with very good results but a limited number of followers, especially when compared with Pokémon. What is extraordinary about the use of smartphones for augmented reality video games is that the player feels as if they are part of the game, rather than a remote observer behind a screen. Players don’t need visors or complex and sophisticated instruments to do this and, instead of a virtual world, their known real-world environment is extended and populated with Pokémon. But unlike Ingress, Pokémon Go is already strongly affecting its players’ lives outside the confines of the game. Gamers, who stereotypically play sat inside, are now encouraged to run and walk around. On the other hand, there is also the possibility that players could have accidents while engrossed in the game, although several alleged incidents appear to have been hoaxes or misreported. And the phenomenon of dozens or even potentially hundreds of people congregating in specific places, including shops and police stations, to play the game is already causing problems. How will we cope with the growth of these kinds of issues as augmented reality becomes more popular? Intuitively, some issues will be fixed by developers. 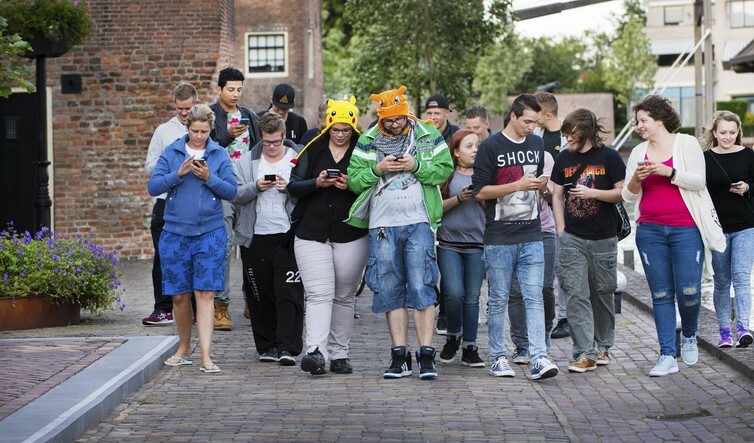 For instance, locations in games such as Pokémon Go where people are encouraged to congregate could be better distributed or given limited capacity. But, as recently happened with selfie sticks, society will also need to react and adapt to this new way of interaction, possibly by designing new rules and by deciding who should be blamed in case of incidents. As a side effect, we may also see a shift in what we think of as socially acceptable behaviours to include augmented interactions. To some extent, what is just starting to happen with Pokémon Go can be seen as an anticipation of what will happen when fully-autonomous systems – such as robots – invade our lives. Delivery drones, driverless cars, and companion robots are currently being tested and are likely to become common in the near future. As with Pokémon Go, new ways of social interaction will be unleashed, and new types of incidents and misuse possibilities will be discovered. There is no clear prediction of how this technology will change our lives, besides some obvious moral dilemmas that will inevitably emerge, such as whether an autonomous car should swerve to avoid a child but hit an adult. But technology such as the augmented reality of Pokémon is revealing a few elements already. Our habits and rules will evolve in order to accommodate autonomous systems, but evolution will come at a price.